There may just be 101 ways to use chocolate, not including in baking. Chocolate comes from a powerful fruit. Yes. Cocoa is a fruit. Cocoa pods grow on trees and cocoa beans are the seeds. Chocolate is made from fruit. So we can all eat it for breakfast, for snack, at a picnic and in a salad. Period. This week I also used chocolate to estimate the weight of an envelope. I know what you're thinking. What the heck am I talking about, right? I know. This really makes no sense and it looks like I'm going nowhere with this but bear with me. Lindt 70% dark chocolate bars are a pantry staple around here. There are at least 3 in the cupboard at all times (and by cupboard I mean nightstand). Lindt chocolate bars are all 100 g and are divided into 10 beautifully crafted, perfectly tempered squares. That means that each square weighs 10 grams. Are you still with me? Great. So here I am about to mail some letters to Canada with my regular stamps on hand, which are only valid for up to a 20-gram parcel. Without a scale, how the heck can I figure out how much this envelope weighs? Two squares of Lindt chocolate! Bingo. So with my letter in one hand, and two squares of chocolate in the other, I conclude that the letter feels lighter and so I'm clear. And, thanks to Lindt my wedding wishes will arrive in Canada in a timely manner. 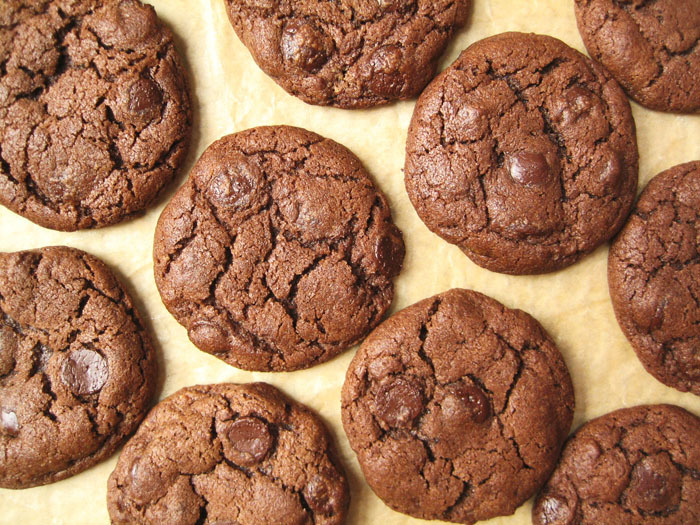 Apart from using chocolate to standardize measurements, it does a dang good job of making cookies taste incredible. 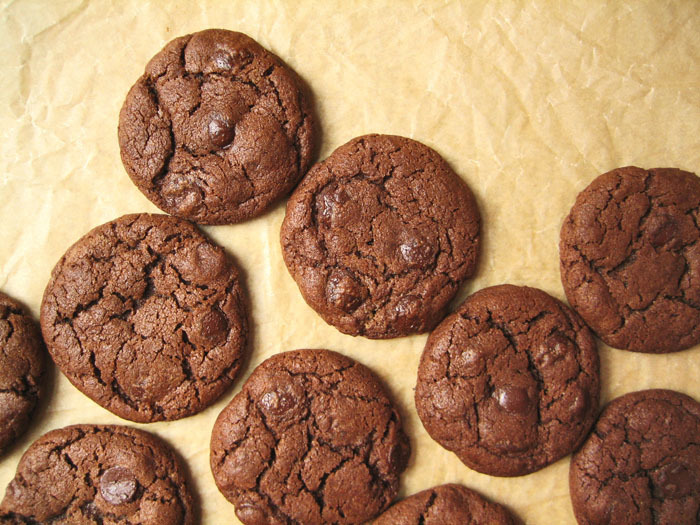 The cookie dough base for these chestnut brown babies uses cocoa powder and creamy peanut butter to deliver that famous flavour marriage that is so beloved in North America. What is it about peanut butter that us North Americanos adore so much? And what is it with other countries making mediocre versions of it? I mean it's mainly ground peanuts - it can't be that difficult. I love you, but step it up guys. Join this PB & Chocolate bandwagon if you know what's good for you! You can use natural or Dutch-processed cocoa here because the acid in the brown sugar is enough to react with the baking soda. Cocoa powder is the defatted or very low fat component of chocolate. When the cocoa nibs are crushed to form a paste called cocoa liquor, the fat (cocoa butter) is separated out to leave dry cocoa solids which ultimately becomes cocoa powder. Natural cocoa powder is untouched and is slightly acidic. Dutched cocoa undergoes an alkalization process that lowers its acidity to make it more basic, and through this process the colour becomes darker. I prefer the flavour of natural cocoa, but in this case the decision is all yours. Then, on top of an already rich and chocolaty cookie dough, a few good handfuls of dark chocolate buttons go in. I love this part. This is also where I have to make sure someone is in the room with me so that I don't eat it. Eat it ALL. It would be more difficult to do this with someone's eye on me because I'd probably be ashamed by their look of shock/disgust/awkwardness/salmonella?/omg-she-is-going-to-be-so-sick-later. But believe me, if I am alone.... haaa... If I am alone, that cookie dough doesn't stand a chance! Preheat your oven to 350 degrees F (175 degrees C). Line 2 large baking trays with parchment paper and set aside. Combine flour, baking soda and salt in a medium bowl. Sift in cocoa powder to remove lumps and stir to blend evenly; set aside. In a medium bowl, cream together butter and both sugars until somewhat light and fluffy using a wide rubber spatula. Add peanut butter and stir until well blended. Stir in the egg and vanilla extract until well combined. Add flour mixture and stir until mostly blended but a few streaks of flour remain. Then add chocolate and fold it in until evenly distributed. The dough will be quite moist, and that’s a good thing. Place the bowl with the dough in the fridge for 20-30 minutes to firm it up slightly so that it is easier to form into balls. Roll heaped tablespoon portions of dough into balls and place on prepared baking sheet, spacing them 2.5 inches apart. Flatten them very slightly with the palm of your hand and bake until cracked at the surface and still quite soft in the middle, 8-10 minutes. Let cookies set 1 minute on the baking sheet before transferring to a wire rack to cool completely. I love that you just told me chocolate is a fruit! 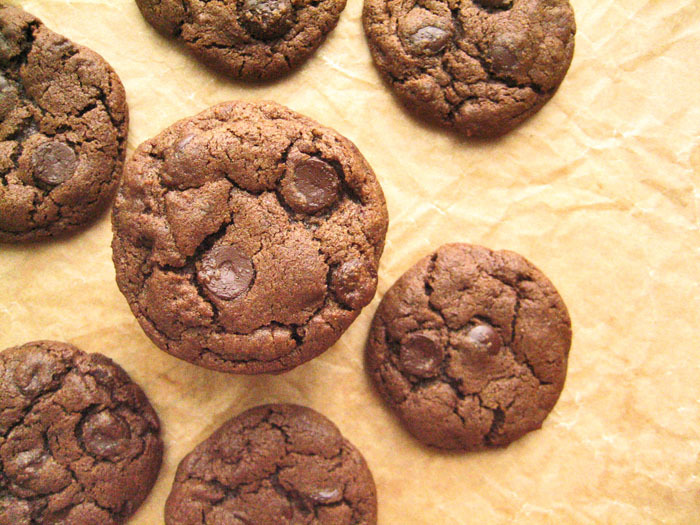 I have never thought about it like that, but now it is officially healthy when I have chocolate for breakfast :) These cookies look so delicious! I'm making them right this minute! I was never a big chocolate and pb fan, but actually my new favorite cookie is the Chocolate Peanut Butter Cookie from LeVain Bakery in NYC. Can't wait to try this recipe!! !